Present Status: Existing. Civil Court Building. General Contractor: American Construction Co.
Building Materials/Description: Six storey granite and buff brick courthouse of steel frame construction with limestone, cast stone, and terra cotta details, central clerestory and dome. Cost to build: $500,000 -1953 – Extensive interior remodeling. -1952 – replaced as a courthouse. Renovated by Finger & Rustay -1956 – Designated Civil Courts Building. -1990 – Third-floor stair landing enclosed. National Register Narrative: The Harris County Courthouse is a six story structure of neo- classical design topped by a prominent clerestory drum and dome. It occupies an entire city block, called Courthouse Square, in the oldest section of downtown Houston near Allen’s Landing. This square, bounded by Fanning Street, Congress Avenue, San Jacinto Street and Preston Avenue, has served as the site of the seat of government in Harris County for more than one hundred sixty years. 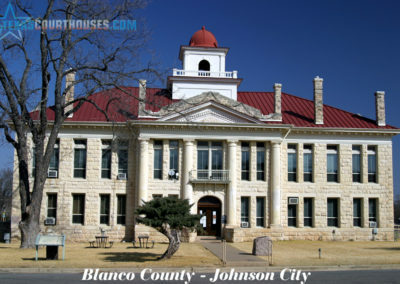 Situated in the center of the square, the courthouse is rectangular in plan (134 feet by 180 feet) and is bilaterally symmetrical about both the major and minor axes. The shorter or side elevations face Congress (north) and Preston (south) and extend almost to the side-walk. The longer, principal elevations face Fanning (west) and San Jacinto (east) and are set back farther from the street. The two principal elevations are identically composed as are the two side elevations. The facades are vertically organized into three zones: a two story base, a three story piano nobile and a one story attic. The rusticated base consists of a raised basement (now the main entry level) and the floor above which originally served as the main entry level. The piano nobile zone contains what was originally a double height courtroom floor with a perimeter mezzanine for courtroom balconies, jury domitories and judges’ chambers. This relationship is externally expressed by tall windows divided midway by bronze spandrel panels. The floor above the mezzanine, now the fifth floor, is the final level of the piano nobile zone. The sixth floor or attic level completes the main block and its separated compositionally from the piano nobile section by a cornice. A circular colonnaded clerestory drum, resting on a shallow octagonal base, rises above the center of the main block. The drum, in turn, supports a high, attenuated dome which rises 200 feet above the ground. Stone American eagles, stationed above the clerestory columns, ring the base of the dome. A Doric lantern with a domical cap once crowned the dome. In early renderings of the courthouse a statue of a female figure stood atop the lantern and other statuary was intended to ornament the roofline. These elements were never realized, however. Today the lantern cap has been removed leaving only the small circular colonnade. Both the principal and side elevations are composed of seven bays in an AABBBAA scheme. Each elevation consists of three colonnaded center bays in a pedimented projection or risalit flanked on either side by two identical bays separated by rusticated piers. The system of construction consists of an interior steel frame which supports the ceilings and floors surrounded by load bearing perimeter walls. Built on a foundation of reinforced concrete, the rusticated base, or first two stories of the building, is constructed of roughcut pink Texas granite. The remainder of the building is faced with light brown St. Louis hydraulic pressed brick. Terra cotta, limestone and masonry ornament is used throughout the building. The original roof of terra cotta tile has been replaced with composition roofing and a small mechanical penthouse has been added to the roof on the west side of the building. The dominant feature of each of the four facades is the central projection or risalit which rises the full height of the main block. Each risalit contains a balustraded loggia in the piano nobile zone. The risalits of the north and south elevations are shallower than those of the principal east-west facades. Paired colossal Corinthian columns frame each of the three loggia bays of the east and west elevations. On the shorter north and south elevations, however, the central bay of either loggia is framed by single colossal Corinthian columns while narrow, fenestrated bays are introduced behind the paired outer ranks of columns. The attic level of each risalit is crowned with a raking parapet. The architrave and frieze of the dentilled raking cornice are detailed with stylized brickwork and iron grills. The tympanum contains a large medallion displaying an open book set within the scales of justice and underlined with a bilateral feather ornament. Other conspicuous decoration on the facades of the courthouse includes sculptured female faces which peer out from scroll brackets positioned like keystones above segmentally arched windows of the second floor. Abstractly rendered lion heads with depending floral ornament occur at the frieze level above the rusticated piers on each elevation. Wide granite steps with side buttresses originally led up to the main entry level (now the second floor) from Fanning and San Jacinto Streets. These stairs have been removed and where they stood, the building has been refused with polished pink granite, defining a new point of entry on the ground level of these two facades. The side entrances on Congress and Preston Avenues retain their original divided staircases but the doorways to which they led have been sealed off at the second floor. First floor entrances under the stair landing are still extant. The fenestration of the building consists of large, unornamented bronze casement windows three sections wide in the loggia bays of the principal and side facades and in the flanking bays of the principal and side facades and in the flanking of the side facades are limited to two sections each. Shorter, one-section windows are placed on each side of the risalits of the east-west facade and on the front of the risalets of the north-south facades behind the outermost columns. All windows are rectangular in shape except those of the second level which are headed with a segmental arch. Today, as a consequence of the remodeling of 1953, little evidence remains of the original interior arrangement and finishwork. The dome has been sealed off entirely. The rotunda has been spanned and covered completely over at each floor level. Similarly, the perimeter mezzanine of what was originally the double-height main courtroom floor has been filled completely in, forming what is now called the fourth floor. This program of alterations has produced six full floors to accommodate various arrangements of lobbies, courtrooms and offices. Two semi-circular staircases which once rose on either side of the rotunda have been closed off above the second level. Two of four original secondary staircases have been left untouched along the east side of the building, retaining their original decorative iron handrails, banisters and open ironwork risers. Black veined marble wainscoting and terrazzo floor new decorates the public areas of the building. The Harris County Courthouse of 1910, now called the Harris County Civil Courts Building, is the fifth courthouse to stand in Courthouse Square on a site set aside for that purpose by the Allen brothers, founders of Houston. 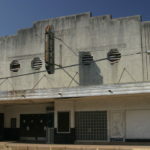 The site and the building have figured prominently in the history of Houston and Harris County. An imposing, domed neo-classical edifice, it is a prime example of the civic architecture of Houston of the l900s and l910s and is the only example in Houston of the work of Lang & Witchell, a leading Dallas architectural firm of that period. When Augusts C. Allen and John K. Allen laid out Houston, the charter they secured specified that “the town was to encompass nine square miles with the courthouse in the center.” Courthouse Square appears on the first map of Houston in 1836 as block #31 which, at that time was the center of Houston. The Allen’s donated the courthouse site with the stipulation that ownership would revert to their heirs were it ever used for any other purpose. The first session of the Eleventh District Court of the Republic of Texas was held uncle the trees of Courthouse Square 10 March 1837. Soon after, the county seat was moved from Harrisburg to Houston, which only one year after its founding has surpassed nearby Harrisburg in population. The following year a small, two-story pine log courthouse was erected on the square. This first courthouse was expanded in 1841 but was sold and removed in 1844 because of structural deterioration. Court sessions were then held in various hotels until a new two-story brick courthouse was completed and dedicated 15 October 1851. Designed by F.J. Rothaas and built for $15,000, it was topped by a cupola and was served by four entrances, one from each street (just as with the 1910 courthouse). The walls and foundation cracked badly and it was demolished after only nine years of service. The new courthouse was intended to be a Greek Revival structure of “great architectural beauty” with portico and pillars. This $25,000 project was begun in 1860 but only the walls, floors and roof had been completed when construction was interrupted by the Civil War. During this period the building was converted to a cartridge factory employing over 200 women and children, while the basement became a guard house for Union prisoners of war. After the end of the Civil War, the building fell into disrepair and was demolished in 1869. The bricks were sold to be used in the construction of Annunciation Roman Catholic Church on nearby Texas Avenue (now listed on the National Register of Historic Places). During the 1870s and early 1880s Courthouse Square was used as a municipal park. In 1883 Edward J. Duhamel, a Galveston architect who had in 1878 won a competition to design Houston’s new city hall and market house, was selected to design a new courthouse. Duhamel produced a handsome, four-story brick Victorian Gothic building cruciform in shape, with a tall spire rising from its center. It was constructed at a cost of $100,000. After nearly 25 years this courthouse, like its predecessors, was demolished, having been deemed hopelessly overcrowded and a fire hazard. In April 1907, a special election was held to approve a $500,000 bond issue to under write construction of the present building. The issue passed overwhelmingly and an architectural competition was held. Fifteen designs were submitted from architectural firms throughout the United States. These entries were first reviewed by a special citizens committee which, after serious consideration of five plans, recommended that the contract be awarded to Lang & Witchell of Dallas. Two of the four County Commissioners concurred with the committee’s recommendation, however, two others voted instead in favor of F.S. Glover & Son of Houston. The deadlock was resolved by County Judge A. A. Amerman, who cast a tie-breaking vote for Lang & Witchell. A second place honorarium of $1000 was awarded to F.S. Glover & Son, and sums of $500 each went to Cooke & Company of Houston and Stone Brothers of New Orleans. The American Construction Company was awarded the general contractor. The 1883 courthouse was vacated in November 1908 and county offices moved to the Prince Theater. The old building was demolished and construction of the new courthouse was begun in mid-1909 and was virtually complete and occupied by November 1910. An open house was held 15 November to coincide with Houston’s annual “No-Tsu-Oh” Festival, but the courthouse was not formally dedicated until 2 March 1911, in observance of the one hundred-fifth anniversary of Texas Independence. Although Otto H. Lang of Lang & Witchell represented the firm during contract negotiations, it was Charles Erwin Barglebaugh, as associate of the firm, who was responsible for the design of the courthouse. Barglebaugh (1881-?) had studied architecture at the University of Illinois and from 1901 to 1903 had worked in the Oak Park Studio of Frank Lloyd Wright, and the following year for Walter Burleigh Griffin. From 1907 until 1917 when he opened his own office, Barglebaugh was employed by Lang & Witchell where he was responsible for much of the firm’s Prairie School work. The firm which he subsequently formed, Barglebaugh & Whitson, designed the Hogg Building (1920-21) in Houston which is listed on the National Register of Historic Places. The choice of style for the Harris County Courthouse was evidently dictated by the specifications for the competition. Barglebaugh, in an article which appeared in the Southern Architectural Review wrote: “In the development of the architectural scheme certa requirements were laid down in the program which led to the choosing of the style of architecture, which had we been free, would perhaps have been developed along different lines. But such specific demands as ‘a large dome’ and ‘columnated facades’ could hardly be disregarded.” The perspective rendering of the initial scheme first published in 1907, reveals a more academically refined structure than was ultimately realized. The Cooke County Courthouse in Gainesville, Texas also designed by Lang & Witchell, is similar in appearance and arrangement to the Harris County Courthouse. The courthouse has undergone several major renovations and alterations since it was completed. In 1934 the interior was redecorated and repainted and the dome cleaned and repainted with “aluminum paint.” The building came close to demolition in 1938 when a bond issue for a proposed three million dollar, eight story courthouse to be built in Courthouse Square was narrowly defeated. In 1852, a blocky, undistinguished courthouse of modern design was erected on the block directly to the south of Courthouse Square, at a cost of $9.5 million. The following year when the new courthouse was completed, all the courts and offices were removed from the Lang & Witchell courthouse. A $2.7 million program of remodeling was then begun according to plans prepared by Finger & Rusty, who had also served as architects for the new courthouse. The renovation seriously compromised the integrity of the interiors of the original building, sealing off the dome and cutting up the central rotunda to provide more space for offices and courtrooms. 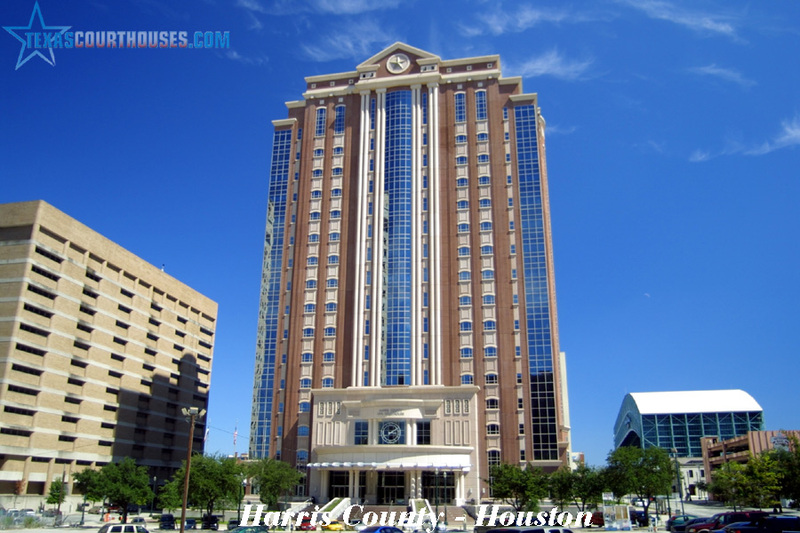 When the building was completed in 1956, it was rededicated and redisignated the Harris County Civil Courts Building. Since then, the county has constructed two new mid-rise office towers adjoining Courthouse Square: the Family Law Center (1969) on the block directly north of the square and the County Administration Building (1979) directly west of the Square. These buildings are connected by means of an underground tunnel system to the 1910 courthouse. None of these buildings nor the 1954 courthouse possess the monumental qualities and civic presence of the 1910 courthouse, which remains the symbolic seat of government in Harris County.